Here are a few links (courtesy of Dave Twomey, a Ph.D. student in the Ph.D. program, Terrorism Studies Option) for people who are interested in a career in municipal and state law enforcement. We’ll post more links and other resources here as they are sent to us via email: ctss@uml.edu. Here is the Powerpoint slideshow that we presented during the CTSS-sponsored reception at the 2015 meeting of the International Security Studies Section/International Security and Arms Control in Springfield, MA. Here is a list of the undergraduate and graduate courses in terrorism and security studies offered at UMass Lowell in the Spring 2016 semester. The U.S. Department of Homeland Security (DHS) Science and Technology Directorate sponsors a 10-week summer internship program for students majoring in homeland security related science, technology, engineering and mathematics (HS-STEM) Disciplines. The program provides students with quality research experiences at federal research facilities located across the country and allows students the opportunity to establish connections with DHS professionals. It is open to undergraduate and graduate students in a broad spectrum of HS-STEM Disciplines and DHS mission-relevant Research Areas. The ultimate goal of the program is to engage a diverse, educated and skilled pool of scientists and engineers in HS-STEM areas and to promote long-term relationships between students, researchers, DHS and research facilities to enhance the HS-STEM workforce. Application deadline is December 1, 2015. UMass Lowell’s Center for Terrorism and Security Studies (CTSS) conducts scholarly research on all aspects of terrorism, political violence and issues of domestic and international security. The Center’s work is multidisciplinary, drawing on many perspectives, research methodologies, and analytic frameworks in order to better understand the causes and consequences of new and emerging security challenges. CTSS is seeking highly motivated students for the academic semester Spring 2016. 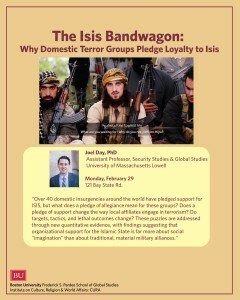 Successful candidates will work on one of two research projects aimed at understanding the activities engaged in by members of terrorist groups. Students may identify specific interests in their applications, but this will not ensure final placement as project needs are subject to change. Positions are unpaid. Academic credit (3 credits) is available with approval from your academic adviser and upon completion of additional requirements (see below). 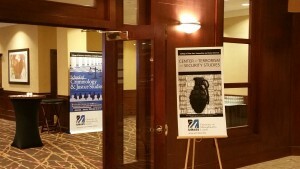 Here are some photos taken at the CTSS-sponsored reception on October 9, 2015 at the annual conference of the International Security Studies Section of ISA and the International Security and Arms Control division of APSA. Quite a strong turnout, well over a hundred people. Thanks to everyone for their support! Click here to read Investigative Interviewing for the Purposes of Gathering Intelligence, a recent special issue of the journal Investigative Interviewing: Research and Practice, dedicated solely to Investigative Interviewing/HUMINT, that co-edited by Mick Williams, CTSS Research Associate and Post-Doctoral Fellow.